Roku is replacing its entire lineup of streaming-video boxes, keeping the Roku Stick while introducing five all-new products, two of which support 4K and HDR (high dynamic range) video decoding. The least-expensive model, the $30 Roku Express, offers twice as much processing power of the existing Roku 1, despite being 75 percent smaller. The Roku Express streams at up to 1080p resolution over HDMI and supports all of Roku’s 3500 apps. It comes with an infrared remote that will depend on clear line-of-sight to the box. At $30, the Roku Express is the cheapest Roku player yet. Unlike the existing Roku 1, however, the entry-level Express doesn’t include the composite video or analog audio outputs that older non-HD televisions need. For that, you’ll need the Roku Express+, which costs $40 and is otherwise identical. It also has an HDMI port in case you upgrade to an HDTV. The Roku Express and Express+ have 802.11b/g/n Wi-Fi adapters. Next in line is the Roku Premiere, an $80 box that supports 4K streaming at 60 frames per second. At that price, it looks to be the cheapest 4K streamer with HDCP 2.2 support on the market (though a 4K Chromecast from Google is rumored). Like the Express models, the Roku Premiere comes with an IR remote. The Roku Premiere delivers 4K video for $80, while the $100 Premiere+ supports 4K HDR. If you have a 4K television with HDR, you’ll probably want the $100 Roku Premiere+. In addition to HDR video support, which helps bring out the colors in dark and light scenes, the Premiere+ has an ethernet port and a MicroSD card slot for storing more apps. Its RF remote doesn't need to be pointed in any particular direction, and it has a stereo headphone jack for private listening. From here up, the new Roku models are outfitted with dual-band 802.11ac Wi-Fi adapters with MIMO (multiple input/multiple output). The $130 Roku Ultra has all the bells and whistles of last year’s Roku 4, plus HDR video and no more internal fan. For processing power, the Premiere and Ultra models are all roughly comparable to last year’s Roku 4 in a package that’s 40 percent smaller (or, for the glass-half-empty crowd, a bit larger than the Roku 3). Thankfully, none of the new Roku players have noisy internal fans. All five players support Roku’s companion app (Android, iOS, and Windows) for private listening, search, and beaming your phone’s photos and videos onto the big screen. The Premiere and Ultra models also have a new feature called Night Listening, which normalizes volume so that loud noises don’t cause a big disturbance. Although Roku isn’t making any major software changes to complement the new hardware, the company says it now has more than 100 channels supporting its universal search function. All of those channels—with the notable exception of Netflix—should also support Roku Feed, a feature that notifies you when your favorite shows, movies, and actors have new content available for streaming. Roku also says it now supports 15 sources in its 4K Spotlight app, which links directly to 4K content from third-party apps. The Premiere+ and Ultra will also have a dedicated row for HDR video, though Roku hasn’t said which sources are supporting the new format. 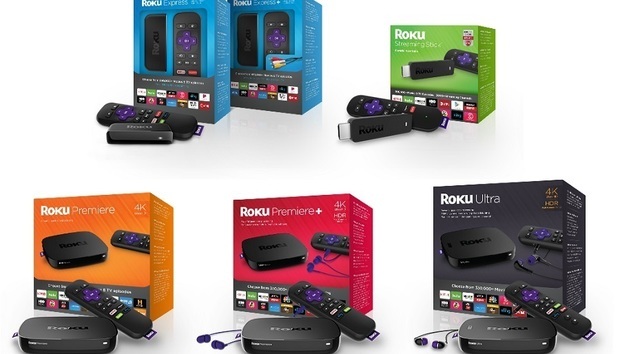 The new Roku players should launch on October 9 through Roku’s website and major retailers, though the Express+ will only be available at Walmart. Why this matters: Roku has 10 million active users between its streaming players and smart TVs, and they’ve already streamed 4 billion hours of video and music this year. With the streaming market expanding, the company now offers a box for every specific need, though the removal of USB storage and a voice remote from the $100 price tier might cause some grousing.